Dextrose is a carbohydrate that greatly helps individuals perform better and last longer to cope with the demands of heavily strenuous activities. 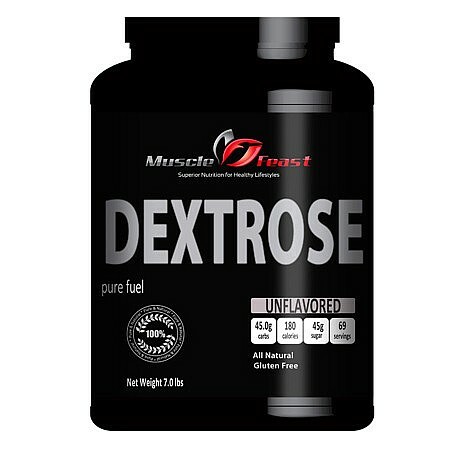 Dextrose is a very convenient energy source that facilitates rapid delivery and absorption of important nutrients by muscle tissues. Muscle glycogen can instantly be replaced during or after exercise. Dextrose is derived from cornstarch and is very easily digestible. The starch is initially cooked. Acids and/or enzymes are then added to break the starch into smaller polymers. The process is highly similar to what occurs inside the body when digesting carbohydrates. Dextrose is also known as glucose, a term that was replaced by the term dextrose. Dextrose is about half as sweet as sugar. It is readily absorbed by the body and mixes very well in fluids. The fine white powder has a bland taste and mixes very well with different types of liquids. The product contains no fat and provides virtually instant fuel for your body. Bodybuilders usually incorporate dextrose in their diets during the bulking phase. One benefit of dextrose is that is increases blood sugar levels almost instantly and the body responds with almost an instant increase in insulin levels, making it ideal for better absorbtion of protein powder and creatine. One drawback would be the extremely high calories, so although dextrose itself contains no fat, the excess calories will result in a combination of muscle and fat gain. Maltodextrin is best mixed with water or fruit juice in a shaker or screw-topped mixer. You may also blend it with protein powder since maltodextrin can improve the protein supplement’s ability to mix while the protein’s flavor can improve maltodextrin’s taste. Consume the mix pre-workout, during workout or post-workout to provide enough energy to last all exercises or to quickly replenish glycogen and carbohydrate stores. Every 46 grams of dextrose will provide around 180 calories and no fat. We guarantee our supplements to be the freshest and purest available: This supplement contains absolutely NO additives, sweeteners or other fillers or agents that many manufacturers use to dilute their products. Muscle Feast, LLC supplements are manufactured under the strictest HAACP, FDA, and Kosher standards, producing the highest quality and purest supplements available. Our raw ingredients undergo state of the art analysis to ensure zero impurities and strict adherence to product labeling. When it comes to price and quality you can’t beat Muscle Feast. We guarantee it!